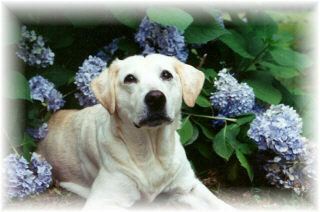 The first Labrador came into our lives in 1971 when Pete gave me a black female puppy for Christmas. Since then we have been hooked. We got a great deal of help and guidance from our good friend Fran Benedict (Greenbrier Labradors) from whom we purchased our first 3 show dogs. I have generally done the conformation showing and Pete has done obedience, putting several titles on dogs including one High in Trial and has also done Hunt Test Competitions. My main contribution to that is throwing ducks, but I love to see the dogs doing what they are bred to do!!! Wildwood has produced and owned a total of 17 champions over the years with hopefully more to come. We hope you enjoy visiting our web pages and meeting some of our dogs. As you will be able to see, we have old timers down to juveniles. They are all much loved and very spoiled. Each one is a special treasure and that is how we want you to feel about the puppy you get from us. I guess the best way to sum up our feelings is that Labs are our love, second only to family and we don't begrudge a minute of the work for all that we get in return. 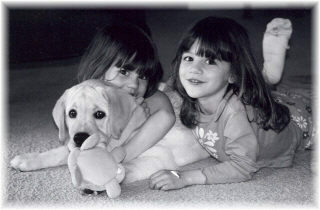 granddaughters and their pup "Nelson"